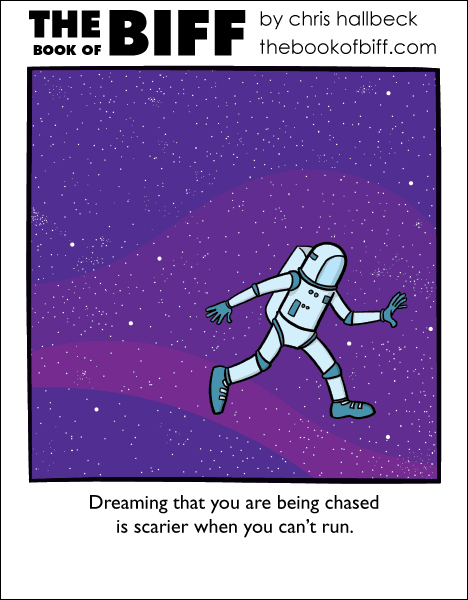 Any dreams I have of being chased seem to start right up mid chase. I’m never just sitting around minding my own business when a monster shows up. It’s usually just the end of the chase where I get to my house and suddenly find it impossible to get the key in the lock. A few times I’ve had a dream where I’m chasing something down. And, just as I realize if I catch up to it, it will most likely shred me like a thing to be shredded. Right before I finally get to it, I wake up. I got to try to recognize when I’m right on it, and try to run in the other direction. I can’t run in a straight line in my dreams. Also, my chase dreams involve hopping fences in order to escape and being concerned with homeowners catching me trespassing.